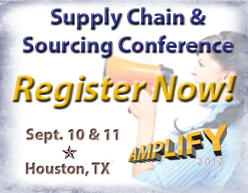 Elemica will host “Amplify 2012,” the next North American Sourcing & Supply Chain Conference on Sept. 11, 2012 in Houston, TX. Attendees will learn about today’s global supply chain challenges and discuss relevant industry issues. Elemica’s solutions address these topics and enable high performance supply chains. The conference will be a mix of large group presentations, small group breakout sessions and networking with peers. Business leaders and executives from global companies like BASF Corporation, Bayer MaterialScience, Celanese, The Dow Chemical Company, ExxonMobil, The Goodyear Tire & Rubber Company, LyondellBasell, Oracle, TPC Group, Wacker and many others will be at the conference. As the leading provider of integration and optimization services for the global chemical, tire & rubber, and energy industries, our customers create and operate high performance supply chains with solutions at the heart of their business, The Real Supply Chain. Elemica delivers state-of-the-art services in the areas of customer, supplier, sourcing, and logistics management. Elemica drives bottom line business results by promoting reduced cost of operations, faster process execution, automation of key business processes, removal of transactional barriers, and seamless information flow between business partners. Elemica was founded in 2000 and today connects more than 5,000 companies across multiple industries, processing over $100 billion in annual transactions. Clients include BASF, Continental, The Dow Chemical Company, DuPont, The Goodyear Tire & Rubber Company, LANXESS, Rhodia and Shell. http://www.elemica.com.